It's mid Feb and this is my first post of the New Year! Time is flying past and I've been so busy. We've been out exploring, thanks to a mild winter. 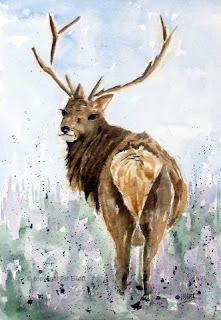 We found the Scottish Deer Centre not too far from us, and from a photo, here's my painting.. Painted on Saunders Waterford paper, and 8"x11" in size. Catch up with you again, soon!